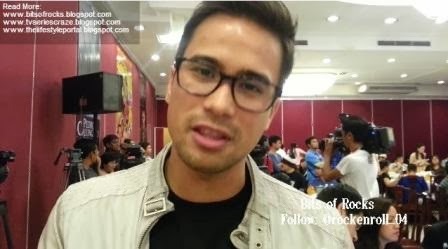 Before the 2013 Holiday ends, the rock-coustic heartthrob Sam Milby greeted me a Merry Christmas! Sam is currently the leading man of Eugene Domingo in the 2013 Metro Manila Film Festival movie entry "Kimmy Dora: Ang Kiyemeng Prequel." On my next post, I will share with you my exclusive interview video with Sam regarding his role in the said comedy flick! Earlier this year, Sam returned on the TV series world via "Huwag Ka Lang Mawawala" opposite the Pinoy Soap Opera Queen Judy Ann Santos wherein he played a lovable villain! And yes, he also had a rom-com teleserye with Angeline Quinto and Paulo Avelino aired on the first quarter of 2013 which is "Kahit Konting Pagtingin." I've already shared with you my cool interview video with this hot hunk actor regarding the said teleserye!